DxO has a background in creating software for correcting optical and digital imperfections in images. As well as offering desktop software to make these corrections, the company’s technology is found in around 300 million imaging devices, including many popular mobile phones. DxO is also the company that produces the software that we use to analyse camera performance. This means that it has an in-depth understanding of optics and image quality, as well as how to correct image problems. As DxO has only produced software to date it comes as a surprise that it has decided to branch out into camera production. But rather than producing a ‘me-too’ type compact, or adding to the long line of GoPro wannabes, the company has decided to produce a camera that is specifically designed for use with an iPhone or iPad with a Lightning connector. It also has the level of control that enthusiast photographers want. The DxO One is about the same size as a GoPro Hero 4 without its waterproof housing and it has an internal frame made from aluminium with a half aluminium, half plastic shell to give it a premium feel. Inside is a 1-inch type 20.2-million-pixel backside-illuminated (BSI) CMOS sensor. DxO doesn’t state where it has sourced the sensor from, but it’s pretty clear from the references to the ‘best 20Mp backside-illuminated 1-inch sensor around’ comments that it has come from Sony. The len has an unusual 6 element design with no flange depth (meaning there’s no space between the final element and the sensor). It has an equivalent focal length of 32mm and a maximum aperture of f/1.8, making it possible to control depth of field for creative image effects. This aperture can be closed down to f/11 when you need more depth of field. The lens also has a closest focusing distance of 20cm, but I got some heavy hints that there will be a macro adaptor coming in the future. Although there is Wi-Fi technology built-in, this is unlikely to be operating when the camera goes on sale in September. There will a firmware upgrade, probably around Christmas, to activate this system. However, the One has a Lightning Connector for direct connection to an iPhone. DxO has gone down this route for easier connection and faster transfer speed. According to DxO, the connector surpasses Apple’s requirements and has been tested to 38,000 actuations. Apparently, it didn’t fail at this point, the engineers just stopped testing. 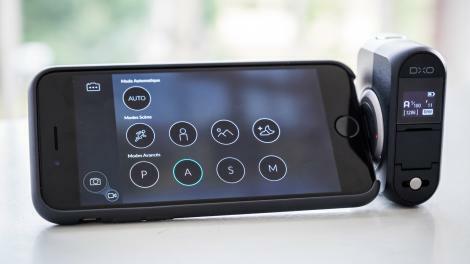 Once the camera is connected to an iPhone or iPad, DxO’s app opens to allow you to take control of the camera. In addition to a fully automatic setting and a small collection of scene modes, it’s possible to shoot in program, shutter priority, aperture priority and manual exposure mode. Sensitivity may be set in the native range ISO 100-12,800 with two expansion settings giving the equivalent of ISO 25,600 and 51,200. Shutter speed can be varied between 15 and 1/8000sec and exposure compensation is available to +/-3EV. There are five preset white balance settings along with an automatic setting and a choice of Full, Centre-weighted and Spot metering. Images are saved as raw (DNG) and JPEG files with raw files being saved to the microSD card in the camera and JPEGs to either the card or the iPhone as you choose. Another file format, SuperRaw, uses DxO technology and takes four raw images at a rate of 22 frames per second with one press of the shutter release. These images are composited into one raw file that can be edited in DxO Optics Pro (the Elite version of this software is supplied with the camera). This compositing enables greater control over noise and better dynamic range. While the One is designed with connected shooting in mind, it can shoot in fully automatic mode without an iPhone. As well as a stills, the One can be used to shoot 1080p video at 30fps or 720 at 120fps (for slow motion playback) in MOV (H.264) format. However, DxO is keen to point out that the One is aimed at serious photographers rather than action cam users. The camera comes with DxO Connect, which is used to import and automatically optimise images as well as Optics Pro Elite for bespoke processing and FilmPack for adding creative effects. Firmware upgrades will be made via the App Store when the camera is connected to an iPhone. Thanks to its aluminium components, the One has a higher quality feel than a GoPro but it’s about the same size and has a similar number of controls on its body. Interestingly, the One’s size was set to match the iPhone 5 so that its base in landscape orientation aligns with the phone’s. This means that the iPhone 6 extends below the One, but it sits comfortably on a table with the iPhone at an angle for viewing from above. On the front there’s a sliding lens cover and the camera powers-up as this is pushed back. Pushing back the cover a second time releases the Lightning Connector on the side of the camera. This slots into an iPhone and triggers the app to start up. On top there’s a physical shutter release button with a two stage movement, but there’s also a virtual button on the iPhone screen. As you’d expect, the phone screen shows icons to access the shooting modes and exposure settings. The One makes a fairly comfortable small grip on the side of the iPhone, but the phone needs a second hand for support. Different users are likely to hold it in different ways – some may prefer to grip the phone and leave the One hanging; it’s light enough to allow that. If you hold the One, you need to take care to avoid your finger straying over the lens. The Lightning Connector is on a swivelling base and can be rotated through +/-60 degrees, for easier screen viewing when shooting at high or low angles, and a clever release mechanism prevents the connector or the phone port from being damaged if the camera is bent back or forwards. If the camera is mounted with the lens facing the same direction as the iPhone screen it automatically actives Selfie mode. While it would be nice for the connector swivel base to allow the camera to be rotated into Selfie mode without disconnecting and reconnecting, I’m told that this would have had a negative impact upon the unit’s durability. Once in Selfie mode, pressing the shutter release focuses the lens and the iPhone screen turns a bright peach colour just as the shot is taken. This puts warm, soft light on your face to make a more attractive image and to help keep the sensitivity level down, so there’s less noise in the shot. A small touch-sensitive OLED screen on the back of the One indicates the camera settings and when the camera is used in standalone mode it’s used to switch between stills and video mode with a swipe. A dot indicates when the lens has been focused. The camera works in fully automatic mode when it’s in standalone mode, but at some point in the future it’s planned to allow users to use the app to specify how they want the camera to operate when it’s used without an iPhone. I found it really easy to locate the settings that I wanted and to make adjustments. There’s face recognition, but a tap of the screen can also set the focus point just as you would normally with an iPhone. Focus speed is about the same as with an iPhone normally. Although the One is essentially an iPhone accessory, it feels well integrated and is easy to use although it takes a little longer for captured images to appear on the screen than it does when using the iPhone camera – at least with the pre-production One I used. The One’s battery is claimed to last for 220 shots or 90minutes of video recording (maximum recording time is 29mins 59seconds at a time). I’ve only used a pre-production sample of the One and I wasn’t able to examine the images I shot on it on a computer. However, the level of detail in the images that I took is very impressive. The illumination screen that pops-up at the point of taking a selfie also helps the camera produce more flattering results than you get in many situations. Distortion appears to be controlled well and the exposure and white balance systems behave as I would expect. According to DxO the standard raw files achieve a score of 70 in the company’s camera testing regime (http://www.dxomark.com/) while the SuperRaw files score 85, putting it amongst some of the best SLRs. We hear lots of claims about a camera’s image quality from manufacturers, but DxO is an expert in testing cameras and lenses and optimising images so it’s interesting to note. We will put these claims to the test when we get a full production sample in for testing. The One doesn’t go on sale until September so we won’t know exactly what it can do until then, but DxO’s claims, the company’s understanding of optics, the likely provenance of the sensor and my initial impression of image quality bode well. The One is exciting for several reasons. For a start, it’s a very small camera that can be carried in the pocket of your jeans, yet has a 1-inch type sensor like the ones found in some of the best compact cameras. It also has a large maximum aperture and an equivalent focal length that’s close to the classic street photographers’ favourite (35mm). In addition, it’s incredibly easy to connect it to an iPhone and can be used with any iOS device that has a Lightning Connector, so it effectively has a very high quality touch-screen. It’s also easy to use and gives photographers full control over exposure. The beauty of DxO’s approach to connecting the One to an iPhone is that there’s no waiting about for a Wi-Fi connection to be made and there’s direct access to all the usual image adjustment and sharing options. DxO is intending to sell the One for £499 (approximately US$780). If it were half this price I think it would fly off the shelves. However, as it stands there are APS-C format SLR and compact camera kits that cost less. Part of the reason for the One’s high price is its novel technology, plus the downsizing and the high quality sensor, but it means that it has to be a much more considered purchase. It may stand-in for an SLR, but it is essentially an expensive compact camera. I’d like one, but I’m not sure I can justify that level of expense. Let’s wait and see what the final image quality is like.